1استادیار بخش تحقیقات فنی و مهندسی کشاورزی، مرکز تحقیقات و آموزش کشاورزی و منابع طبیعی خراسان رضوی، سازمان تحقیقات و آموزش ترویج کشاورزی، مشهد، ایران. 2دانشجوی دکتری تکنولوژی مواد، گروه علوم و صنایع غذایی، دانشکده کشاورزی، دانشگاه فردوسی مشهد. زعفران به‌ عنوان گران‌ترین محصول کشاورزی و دارویی جهان، ارزش ویژه‌ای دارد. با توجه به بازه برداشت کوتاه این محصول، نگهداری گل زعفران در شرایط مناسب جهت فراوری با تأخیر، نیازمند بررسی عوامل مؤثر بر کاهش کیفیت زعفران است. اثر ضخامت انباشتگی، دمای نگهداری و زمان نگهداری گل زعفران بر شاخص‌های شیمیایی کروسین، سافرانال و پیکروکروسین و آلودگی‌های میکروبی کل، کلی‌فرم و کپک با استفاده از شبکه عصبی مصنوعی پرسپترون چند لایه مدل ‌سازی گردید و ساختار شبکه با استفاده از الگوریتم تکاملی ژنتیک بهینه ‌سازی شد. شبکه عصبی بهینه با ضریب تبین بالاتر از 94 درصد و خطای پایین، قادر به پیش‌بینی ویژگی‌های کیفی زعفران تحت شرایط نگهداری بود. بررسی مدل نشان داد ضخامت انباشتگی تأثیر کمی در مقایسه با دما و زمان نگهداری بر کیفیت شیمیایی و میکروبی زعفران دارد در حالی ‌که افزایش دمای نگهداری کاهش کیفیت شیمیایی و میکروبی را شدت می‌بخشد و زمان نگهداری نسبت به دما اثر کمتری دارد. نگهداری گل زعفران در دمای پایین و نزدیک به صفر درجه سانتی‌گراد برای حداکثر حفظ ترکیبات شیمیایی ارزشمند و کمترین توسعه آلودگی میکروبی طی نگهداری الزامی است. Saffron, as the most expensive agricultural and pharmaceutical product of the world, has a special value among plants. Since the Saffron harvesting period is short, its storage for later processing requires understanding the most effective factors affecting the quality of saffron and its deterioration. Therefore the effects of reposition thickness, storage temperature and storage time of saffron flowers on its chemical parameters including crocin, safranal and picrocrocin values of saffron stigma and its microbial quality indicators including total count, coliform and mold contamination were modelled. This was done using multi-layer perceptron artificial neural network (ANN) and its structure and the learning parameters were optimized using genetic algorithm technique. The optimized MLP neural networkwas capable to predict the saffron quality characteristics during storage with coefficient of determinations higher than %94 and low error values (RMSE lower than 3.5 for all responses). The ANN model showed that reposition thickness has the lowest impact on chemical and microbial parameters deterioration while increasing storage temperature and time drastically increased loss of quality although the effect of storage time is lower than that of storage temperature. Overall, keeping fresh saffron flowers at a low temperature near zero degrees centigrade is necessary for maximum retention of valuable chemical compounds and minimum microbial contamination development during saffron flower storage for further processing. Ahmad, S., Tahir, I., and Shahri, W. 2013. Effect of different storage treatments on physiology and‎ postharvest performance in cut scapes of three Iris species. Journal of Agricultural Science and Technology 15 (2): 323-332. Alonso, G.L., VarÕN, R., Gomez, R., Navarro, F., and Salinas, M.R. 1990. Auto-oxidation in Saffron at 40°C and 75% Relative Humidity. Journal of Food Science 55 (2): 595-596. Amirghasemi, T. 2001. Saffron, Red Gold of Iran. 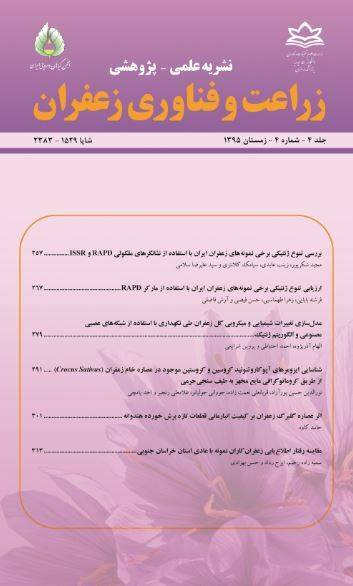 Ayandegan Publication, Tehran. Bolandi, M., Shahidi, F., Sedaghat, N., Farhoush, R., and Mousavi-nik, H. 2008. Shelf-life determination of saffron stigma: Water activity and temperature studies. World Applied Sciences Journal 5 (2): 132-136. Cevallos, J.-C., and Reid, M.S. 2001. Effect of dry and wet storage at different temperatures on the vase life of cut flowers. Hort Technology 11 (2): 199-202. Cook, D.F., Ragsdale, C.T., and Major, R.L. 2000. Combining a neural network with a genetic algorithm for process parameter optimization. Engineering Applications of Artificial Intelligence 13 (4): 391-396. Da Silva Vieira, M.R., de Medeiros, D.C., Costa, P.N., Santos, C.M.G., de Alencar Paes, R., de Sousa Fernandez, L.M., de Oliveira, N.G., Allan, A., and Silva, F. 2012. Effect of refrigeration on post-harvest flowers. African Journal of Biotechnology 11 (67): 13065-13068. Ferentinos, K.P. 2005. Biological engineering applications of feedforward neural networks designed and parameterized by genetic algorithms. Neural Networks 18 (7): 934-950. ISIRI. 2008. Microbiology of Saffron –Specification (5689). Institute of Standards and Industrial Research of Iran, Tehran, Iran. ISO. 1993. Saffron (Crocus sativus L.). The International Organisation for Standardisation, Switzerland. Izadifar, M., and Jahromi, M.Z. 2007. Application of genetic algorithm for optimization of vegetable oil hydrogenation process. Journal of Food Engineering 78 (1): 1-8. Joyce, D.C., and Shorter, A.J. 2000. Long term, low temperature storage injures kangaroo paw cut flowers. Postharvest Biology and Technology 20 (2): 203-206. Lefebvre, C., and Principe, J. 2005. Neuro Solutions. Neuro Dimension, Inc.
Lutz, H.E.W. 1930. Picrocrocin, the bitter principle of safran. Biochemistry 226 (97): 25. Ministry of Agriculture Jihad. 2014. Agricultural Statistics. Department of Economic Development and Planning of Statistics and Information Technology, Thran, Iran. Mohebbi, M., Shahidi, F., Fathi, M., Ehtiati, A., and Noshad, M. 2011. Prediction of moisture content in pre-osmosed and ultrasounded dried banana using genetic algorithm and neural network. Food and Bioproducts Processing 89 (4): 362-366. Molina, R.V., Valero, M., Navarro, Y., Guardiola, J.L., and García-Luis, A. 2005. Temperature effects on flower formation in saffron (Crocus sativus L.). Scientia Horticulturae 103 (3): 361-379. Nazghelichi, T., Aghbashlo, M., and Kianmehr, M.H. 2011. Optimization of an artificial neural network topology using coupled response surface methodology and genetic algorithm for fluidized bed drying. Computers and Electronics in Agriculture 75 (1): 84-91. Nowak, J., and Rudnicki, R.M. 1990. Postharvest Handling and Storage of Cut Flowers, Florist Greens, and Potted Plants. Timber Press, Portland. Pellegrini, M., and Bellé, R. 2008. O que você precisa saber sobre pós-colheita de flores. Revista Campos and Negócios, Uberlândia 5 (69): 41-42. Raina, B.L., Agarwal, S.G., Bhatia, A.K., and Gaur, G.S. 1996. Changes in pigments and volatiles of saffron (Crocus sativus L.) during processing and storage. Journal of the Science of Food and Agriculture 71 (1): 27-32. Shekarchizadeh, H., Tikani, R., and Kadivar, M. 2014. Optimization of cocoa butter analog synthesis variables using neural networks and genetic algorithm. Journal of food science and technology 51 (9): 2099-2105. Tarantilis, P.A., Polissiou, M., and Manfait, M. 1994. Separation of picrocrocin, cis-trans-crocins and safranal of saffron using high-performance liquid chromatography with photodiode-array detection. Journal of Chromatography A 664 (1): 55-61. Turhan, H., Kahriman, F., Egesel, C.O., and Gul, M.K. 2008. The effects of different growing media on flowering and corm formation of saffron (Crocus sativus L.). African Journal of Biotechnology 6 (20): 2328-2332. Van Doorn, W.G., and Han, S.S. 2011. Postharvest quality of cut lily flowers. Postharvest Biology and Technology 62 (1): 1-6. Xie, G., Xiong, R., and Church, I. 1998. Comparison of kinetics, neural network and fuzzy logic in modelling texture changes of dry peas in long time cooking. LWT - Food Science and Technology 31 (7–8): 639-647.